Thai Coconut Sticky Rice with Mango is a Southeast Asian dessert which combines rice, coconut milk, palm sugar or white sugar, and mango. The dish is simple and quick to make, but it does require care in buying ingredients and possibly learning a rice steaming technique which may be new to you — Thai sticky rice has cannot be cooked like other rices because if it touches any boiling water while it is cooking then it will get mushy. It is important to use Thai sticky rice, which is a special type of sticky or glutenous rice which is soaked in water overnight before being steamed over (not in) water, because the texture of this rice is an important part of this dish. 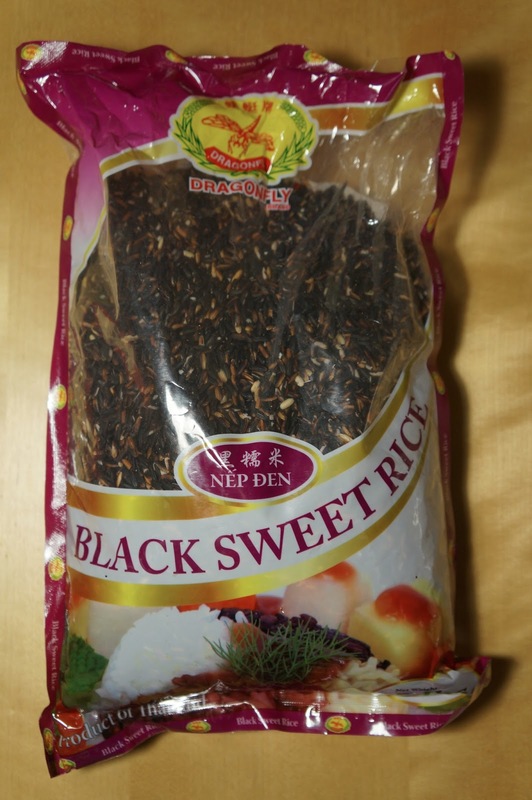 Chinese glutenous / sweet rice is something different and cannot be used as a replacement. 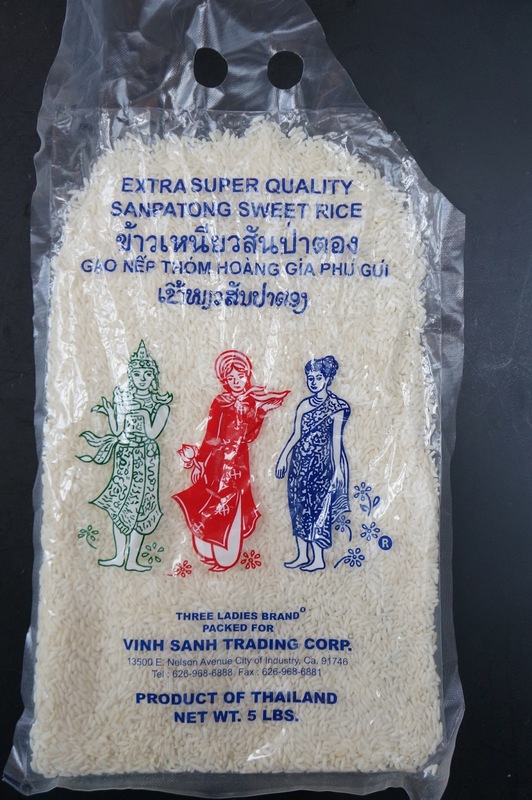 In order to make sure you are buying the correct type of rice, make sure your sticky rice was grown in Thailand or Laos (it may be marked as “sweet rice”). You will also need to plan ahead and soak the rice 6 to 24 hours. See here for detailed directions on what type of rice to buy and how to make sticky rice. See Bay area sources for ingredients for a list of some markets that you can buy Southeast Asian ingredients from. Regular Thai sticky rice is white colored, but you can also make purple colored sticky rice. The purple rice is actually a mix of white rice and a special type of unhulled black-colored Thai sticky rice (see purple Thai sticky rice for more information). 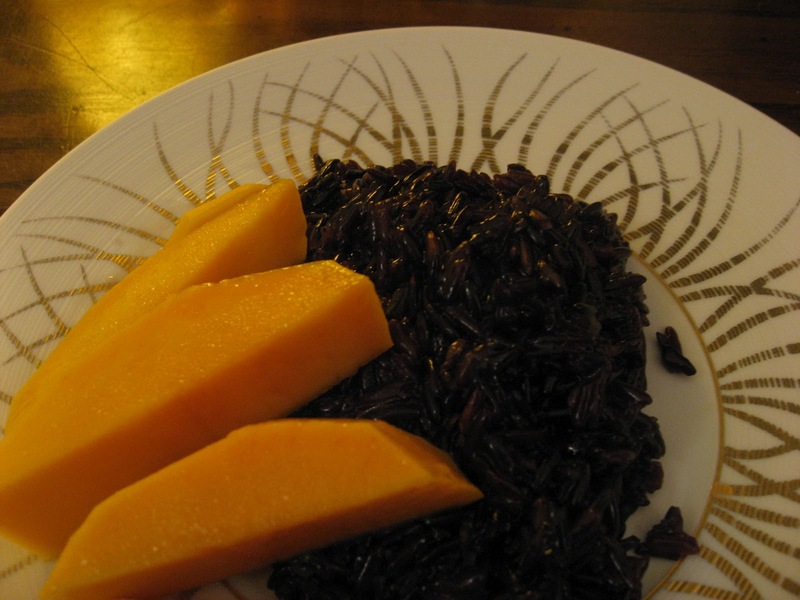 Purple rice has nearly no difference in flavor, aside from the slight crunchiness due to the unhulled purple grains (i.e. because it is “brown rice”) — the white rice is usually mixed with it for its soft consistency — the resulting mixture of rice has a soft-texture. The color from purple grains bleeds and dyes the white grains to a purple-color. The mixture of white and purple rices can be adjusted as you prefer — I like a mix of 1/3 purple rice and 2/3 white rice. Taste-wise, William and I prefer white rice because we find the crunchy purple grains distracting, but visually, the purple rice looks very dramatic. If I’m preparing Thai sticky rice for dinner, I often make some extra rice to use in this dessert since it takes very little additional work once the rice is cooked. I often ask William to cut the mango while I finish cooking dinner, so all I have to do is melt some palm sugar and a pinch of salt in coconut milk and mix it into the rice. For simple dinners like this, I only prepare one color of rice, and I skip making the “White Sugar Sweetened Coconut Cream” and just make extra palm-sugar-sweetened coconut milk for drizzling. If I am serving Thai sticky rice with dinner and also making this dessert, I usually soak 1 1/2 cups to 2 cups of raw rice for the two of us, and use half of the rice with dinner and half in this dessert. A serving size is equivalent to 1/2 cup raw rice, so if you are only making this dessert and not any rice to go with dinner, you should soak 1 cup raw rice for 2 people if you don’t want any leftovers. The type of mangos used to make this dish are also important to its success. Use very ripe, sweet mangos, which are smooth-fleshed and not very fibrous such asataulfo mango (also called manilla) which are small, yellow, and have a slight S-curve to them (see here and here). Ataulfo are ripe when they are slightly soft (like an avocado) and slightly wrinkled, and they are great to use in this dish because they are smooth-fleshed and very sweet.SheSimmers.com says that in the United States, the type that is closest to what is used in Thailand are the Manila or Ataulfo mangoes (Ok-Rong and Nam-Dokmai are the names of the type that is used in Thailand). Try not to use Tommy Atkins mangos (the large greenish-red ones) because they are very fibrous. See here for more information about some varieties of mangos. Source: Modified from “Coconut Milk Sticky Rice with Mangos (Khao Neeo Mamuang)” from “Hot Sour Salty Sweet: A Culinary Journey Through Southeast Asia” by Jeffrey Alford and Naomi Duguid. For white-colored rice: 1 cup raw white Thai sticky rice. For purple-colored rice: 1/3 purple Thai sticky rice mixed with 2/3 cup white Thai sticky rice. Sauce option #1 (Palm Sugar Sweetened Coconut Milk): This option uses the same sweetened coconut cream to mix into the rice and for drizzling. This is the quickest option to make, since it only requires one sauce. Sauce option #2 (Palm Sugar Sweetened Coconut Milk for the rice and White Sugar Sweetened Coconut Cream for drizzling): The white sugar sweetened coconut cream is used for drizzling because this sauce is prettier since it is white-colored (The palm sugar coconut cream will be slightly beige colored). This drizzling sauce is also saltier since its saltiness emphasizes the mango’s sweetness. Place the Thai sticky rice in a large bowl that can hold twice the volume of the rice. Rinse the rice and then cover by 2 to 3 inches with room temperature or cold water. Let sit overnight (6 to 24 hours). 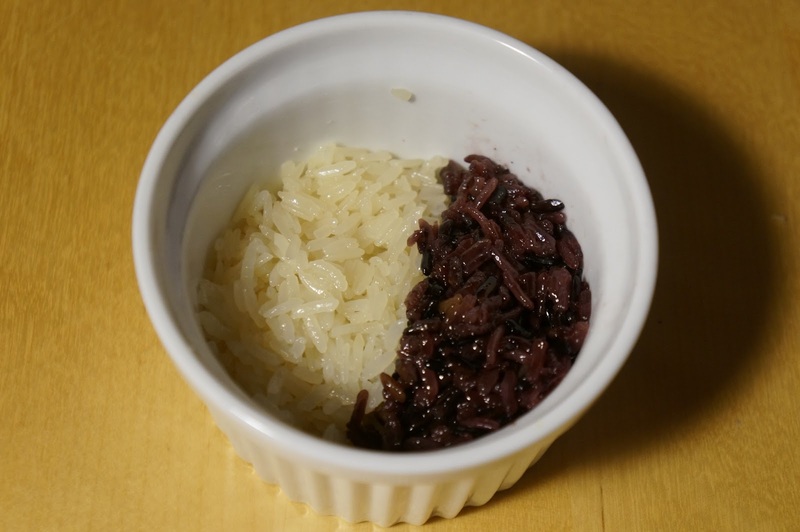 If using a mixture of purple rice and white rice, the color from the purple rice will slowly dissolve into the water and color the white rice. When you are ready to cook the rice, heat water in a steamer until it is boiling. 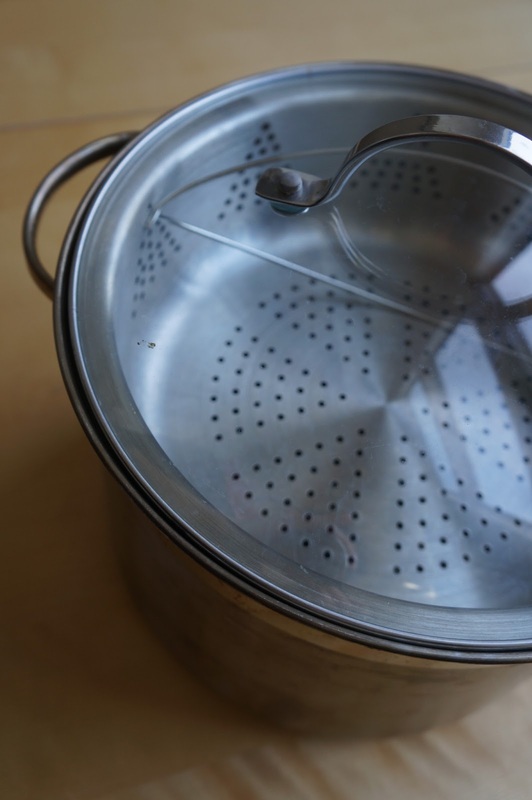 Make sure there is enough water so that the steamer won’t dry out when you cook the rice. Drain the sticky rice and then steam it at a rolling boil until tender, 25 minutes for white Thai sticky rice and 45 minutes for purple sticky rice. See this post on sticky rice for more information about cooking Thai sticky rice. Peel and cut the mango into thin slices or bite-sized cubes****. Store the mangos in the refrigerator while you make the rice, since the cool sweet mangos contrast nicely with the slightly warm or room temperature rice. Make the palm sugar sweetened coconut milk by placing the coconut milk, sugar, and salt in a heavy pot over medium to medium-low heat and stir until the sugar is dissolved. Do not boil, because you will change the texture and taste and may split the oil from the milk. 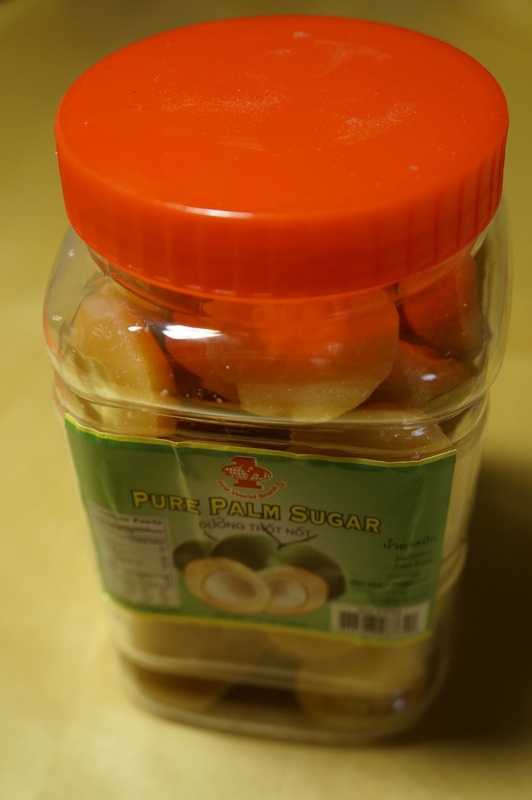 Palm sugar needs to be heated in liquid to dissolve; it may take a while–be patient. If you need to do another task (such as cutting up the mango), you can turn off the heat for about 5 minutes, so that there is no chance of it boiling when you are not paying attention. Since the coconut milk stays hot, the palm sugar dissolves even when the heat is off. If making the”White Sugar Sweetened Coconut Cream”, follow recipe below; placing the white sugar sweetened coconut milk in a ketchup bottle will make serving easier. When the rice is tender (try a small bite to make sure), put it in a bowl. Remove and discard pandan leaves, if using. Sauce option #1: Mix half of the warm or room temperature coconut milk into the rice (about 1/3 cup). If you think that the rice isn’t sweet or moist enough, you can add some of the extra sweetened coconut milk. Reserve the extrapalm-sugar-sweetened coconut milk for drizzling. Sauce option #2: Mix all the palm-sugar sweetened coconut into the rice. Use the “White Sugar Sweetened Coconut Cream” for drizzling. Break up any clumps in the rice and mix until it is evenly mixed and the rice starts to absorb the coconut milk. Let stand for 20 minutes to an hour to allow the rice to fully absorb the coconut milk and for the flavors to blend. To serve, place an oval mound of rice on a large serving plate or on individual serving plates. Top with some mango slices arranged in an attractive fashion. Use a small amount of the drizzling sauce to sweeten the mango, and bring the extra drizzling sauce and mangos to the table, so that diners can sweeten their dish even more. The rice tastes best within an hour of when it is made. After that,The coconut milk keeps the rice moist so you can eat it for the next 24 hours or so but it will dry out some — to freshen leftovers, mix in some extra drizzling sauce to remoisten. Revitalize it by heating it (either by steaming it or using a microwave), though it will taste like leftovers and never be as good as when it is freshly made. * The pandan leaves are completely optional–I find that they don’t add any noticeable flavor to the rice, but if I have some around I like to use them to help prevent sticking(see here for more information). If I don’t have any pandan leaves, then I put the rice directly in my metal steamer and I haven’t had a problem with sticking. Pandan leaves can be found either fresh or frozen. They can be stored long term in your freezer. If you can find them, it is better to buy fresh pandan leaves and freeze them yourself than to to use frozen ones. ** Suggested coconut milk brands: Kasma Loha-unchit’s suggestions and SheSimmers.com’s suggestions. *** Although many recipes for this dessert, including many traditional ones from Thailand, use white sugar (see for example Kasma Loha-unchit’s recipe, and SheSimmers.com’s recipe), I like to use palm sugar to sweeten the rice since palm sugar adds a burnt caramel taste. Some other authors agree — palm sugar is used in David Thompson’s recipe for “Caramelized Coconut Rice” in “Thai Food” and Jeffrey Alford and Naomi Duguid’s recipe in “Hot Sour Salty Sweet: A Culinary Journey Through Southeast Asia”. Palm sugar will cause the white rice to turn slightly beige in color, whereas white sugar will keep the white rice a pristine white color. SheSimmers.com says that white sugar, not palm sugar, is normally used in Thailand, though she admits that she also likes the taste of the palm sugar version. While it is true that white sugar is much sweeter than palm sugar, many recipes use a lot more sweetener than my recipe the quantity of sugar doesn’t necessarily need to be reduced when white sugar is substituted unless you prefer less sugar (caveat: I haven’t tried the white sugar variation though).If you want to try to keep the same amount of sweetness, try replacing every 12 Tbsp of palm sugar with 8 Tbsp white sugar–I haven’t tried this ratio yet, so taste and adjust accordingly. The amounts of coconut milk and sweetener used in this dish often vary according to individual taste so feel free to adjust the amounts and to mix them to taste. I prefer palm sugar which has been molded into Tbsp sized pieces because it makes measuring easy, though it will take slightly longer to melt it. I find it difficult and time consuming to chip off pieces from big blocks of palm sugar or grate it with a microplane grater, so I recommend the type of palm sugar which comes in Tbsp sized pieces. **** There are several ways that a mango can be cut. One way is: Peel the mango with a peeler. The mango pit is flat and runs parallel to the broadest part of the mango. Cut of two lobes from each side of the pit. Try to slice off as much meat as possible without cutting into the pit. If you hit the pit, shift over a bit more and recut. Slice the lobe lengthwise into slices or bite sized cubes — for example you can, slice the lobes lengthwise into 1/4 inch thin attractively shaped pieces, cut at a slight angle, rather than straight down, and keep the slices in their original order, preferably lined up the way they were before you cut them so that they can be displayed in a fan shape on the dessert. Also pare off the additional meat from the sides, top and bottom of the seed; you can save this fruit for another usage (such as snacking on it, since these pieces aren’t very pretty) or serve them with this dessert if you don’t mind their irregular shape. There are two common variations for the sauce that is drizzled on top of the coconut rice. The first is the simple way of using the same sweetened coconut milk that was mixed into the rice; since you only make one type of sweetened coconut cream this is a quickest version of the dessert. A nicer variation is to make a second sweetened coconut cream for drizzling which is slightly more thickened and slightly saltier — this is the way its done in Thailand at shops and stands that sell this dish. Below are directions to make this second coconut cream for drizzling. The sweetened coconut milk (the one used as the topping and even mixed into the rice) should also have a salty component, in order to bring out the sweetness of the rice and mango (seeSheSimmers.com and Kasma Loha-unchit). Specifically Kasma Loha-unchit says that “the coconut sauce should have a pronounced saltiness behind the sweetness. The saltiness will help bring forth the rich flavors of coconut milk and the delicate taste of sticky rice. Also, the salty-sweetness of the flavored rice enhances rather than distracts from the fruity sweetness of mangoes.” The recipe below is for a sweetened coconut cream which has an even more pronounced saltiness than the one that is mixed into the rice — this can be adjusted to your preferences. This white sugar sweetened coconut cream is often used for drizzling over desserts. White sugar is usually used, not palm sugar, so that the topping will be a pure white color since palm sugar will make the coconut cream beige-colored. Rice flour is used to thicken it; the thickened cream drizzles nicely over the dessert. It is the most traditional thickener, but I’ve also seen references to corn starch being used as the thickener (probably in the United States where this item is common), so if you don’t have rice flour then you can probably substitute corn starch (though I haven’t tried this). Source: Modified from the recipe for “Sweet Coconut Cream” from “Thai Food” by David Thompson. Mix rice flour with a cold little water or coconut milk (this prevents it from forming lumps in your coconut milk). Make sure there are no lumps. Heat coconut cream and salt, but do not let boil. Stir in the flour paste, and continue heating and stirring until the mixture thickens. You can let it come nearly to a boil, but don’t let it boil (remove it from heat when it gets close). If it isn’t very thick, you can make a little bit more flour paste and cook it in the mixture. Do not add the sugar until the flour has thickened the mixture, otherwise it will lose its sheen and become an unappetizing grey. Once the mixture is thick, add the sugar and stir until it is dissolved. The mixture should taste noticeably salty and a little sweet. Remove from heat and let slightly cool. Move the mixture to a small container or serving pitcher (a ketchup bottle works well). Refrigerating helps the mixture thicken a bit. preferably 2 steamers, one for each type of rice so that they can be cooked at the same time (but if you only have one, it is also okay to cook one rice at a time). This section explains how to style this dessert like the first picture in this post. It makes enough for 5 servings with 1/4 cup cooked white rice and 1/4 cup cooked purple rice per person; this is a slightly smaller serving size than in the recipe above. 1 can of coconut milk (13.5 oz) is about 1 1/2 to 1 3/4 cups; this is enough to make the sweetened coconut cream for both rices and the “White Sugar Sweetened Coconut Cream” with a little extra coconut milk. You can add the small amount of extra coconut cream to either sauce and increase the salt or sugar if it tastes like it needs it; the measurements for these sauces don’t have to be precise. 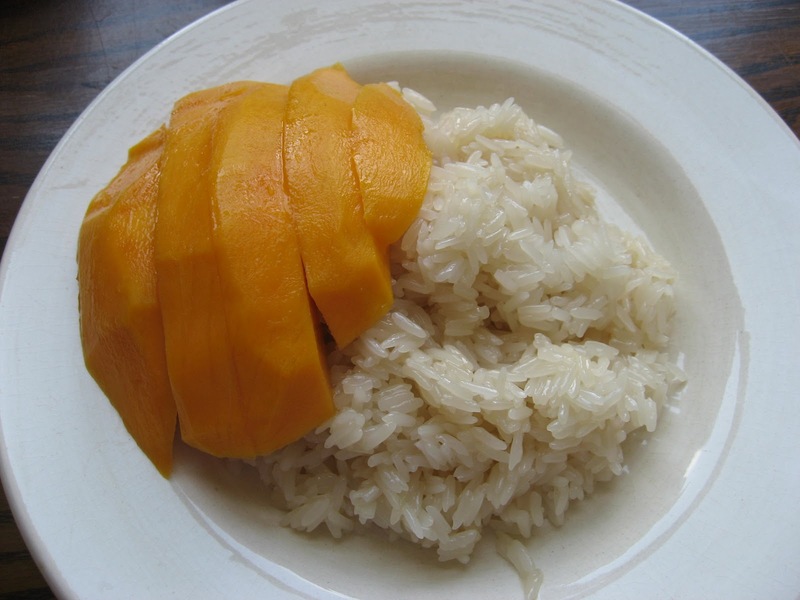 Follow the recipe above for “Thai Coconut Sticky Rice with Mango” once to make white sticky rice and once to make purple sticky rice. Make the two rices in separate containers, since the purple rice will stain the white rice if they are steamed or soaked together; if you happen to have two steamers, then it won’t take much more time to make both rices than it does to make one rice. You can make the sweetened coconut cream for both rices at the same time by doubling the recipe for the sweetened cream. Double the recipe quantity of the “White Sugar Sweetened Coconut Cream”. You can find banana leaves in the frozen section of many Southeastern Asian markets. The frozen ones tend to have many rips in them, so you will probably use most of the package. Sometimes you can find frozen banana leaves which have already been cut into circles. 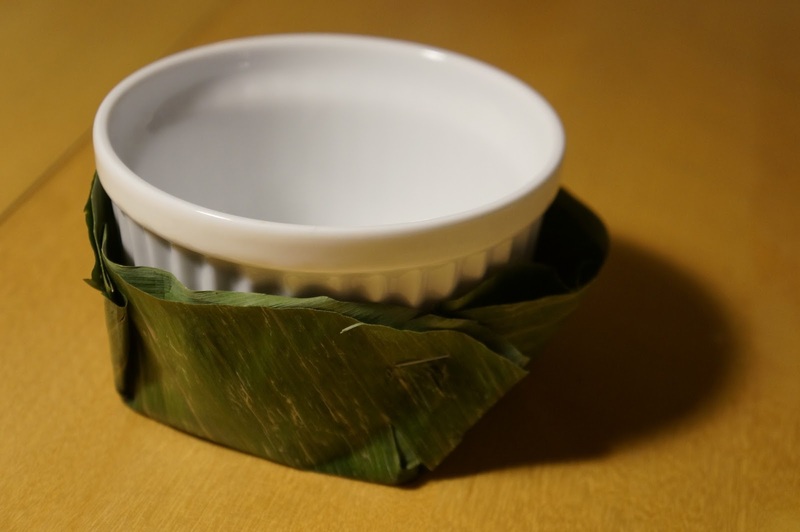 You should make the banana leaf cups before you begin steaming the rice since they will take a while to make; they will stay green for hours (perhaps even overnight) if you store them in the refrigerator (the banana leaf cups will dry out and become less bright green if they are left at room temperature for hours) so you can make them ahead of time. Defrost the banana leaves (they unfreeze in quickly–in less than 30 minutes); rinse and dry the banana leaves. See cuisinethailand.blogspot.com for more information about how to make the banana leaf cups–the technique is to cut out circles, and to fold four corners upward and staple them in place. To get the cups sized correctly, I traced a few bowls of a different sizes onto sheets of paper, folded and stapled them, and testing their size in my steamer. I decided to use a bowl with a 7 inch diameter, and used the ramekin (bottom down on the bamboo leaf since the bottom is narrower on min) to control where the edges of the cups were folded so that the cups were a consistent size. Once you know what size to make the circles, cut out the circles in the banana leaf cuts using a knife to cut around the circumference of a bowl (you can do at least two layers at a time). Try to cut the circles out of areas in the banana leaves that don’t have tears. Since my banana leaves had a lot of rips in them, I made each cup from two circles placed on top of each other, with both shiny sides out, and the ribs of the two sheets placed orthogonally towards one another. 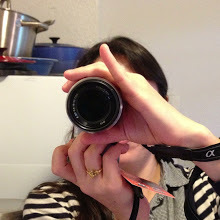 To create the cups, place a small ramekin in the center of the leaf (the ramekin is used to keep the sizes consistent). Fold the banana leaf (or leaves, if using two layers) up and pinch the excess and fold it to the side. 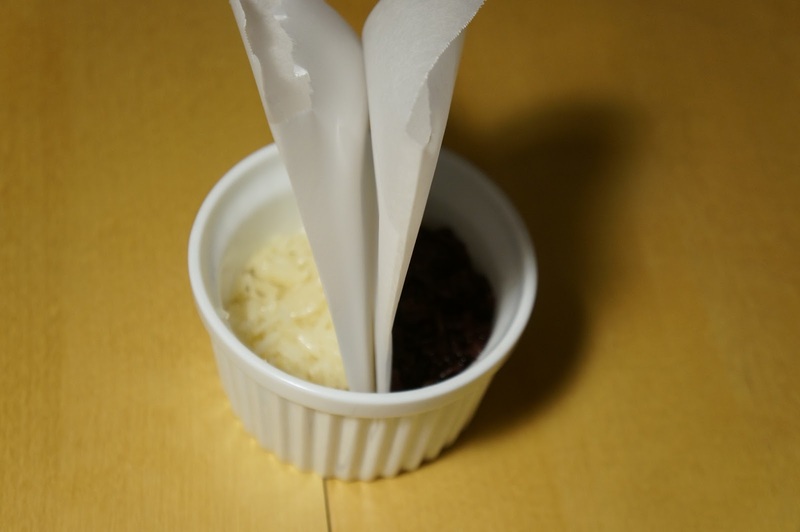 Temporarily remove the ramekin so it isn’t in the way and staple the corner to hold it in place. Repeat folding and stapling on the opposite side, and then on the two points, on the left and right edges, between the folded top and bottom. The four stapled corners will create a bowl. To fill the cups, I used parchment paper to divide a ramekin in half and filled one half with 1/4 cup white coconut sticky rice and the other half with 1/4 cup purple rice. Next I removed the parchment paper and lightly pressed the rice down to even out the top and to make the two halves stick together. Finally, I overturned the ramekins into the banana leaf cups. However, I recommend using a ring mold instead, because the rice slightly stuck to the ramekin and lost its circular shape when I turned it over. Fix any stray grains of rice using some sort of utensil, such as chopsticks. Fan out the slices from 1/2 of a mango lobe or arrange them in some other attractive fashion. You may want to remove the small end piece if it is very small and oddly shaped and save it for another usage. 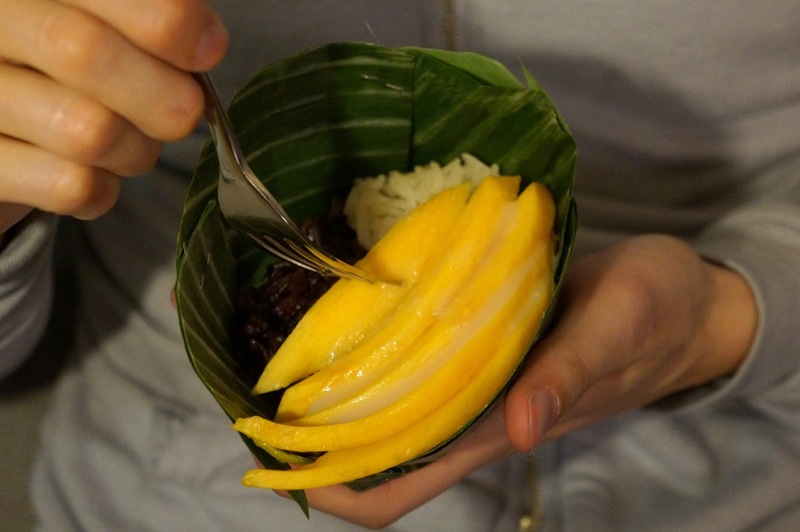 Arrange the mango slices on top of the rice in a banana cup (e.g. on the side covering the white rice by about 2/3 and the purple rice by about 1/3 or in the center between the white and purple rice). Repeat for all banana cups. Optionally arrange the banana leaf bowls in the Chinese steamer to serve. If you want to put the lid on, be sure that none of the mango slices are overhanging the lip of the steamer, otherwise you will smoosh their edges. Other ideas are that you can garnish with toasted black or white sesame seeds. Serve within an hour with some white sugar thickened coconut cream drizzled on top of the mango. If you have extra coconut milk topping, offer it to diners for them to add to their dishes.